Fried rice is one of my favourite foods to make in a big batch because it reheats so well for lunch the next day! 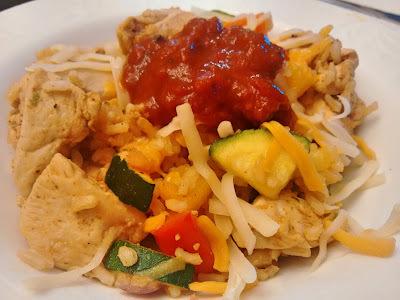 I decided to combine the burrito bowl concept with fried rice to make a fajita version. Cook the rice either the night before or the morning of, and allow it to cool fully and refrigerate it. I also cooked the chicken in two batches, since I didn't want to crowd the pan. Slice chicken breasts into bite sized pieces. Mix spices together in a small bowl. Grease a wok with canola oil and set to medium heat. Place chicken pieces into wok and squeeze lime juice over chicken. Season with spice mix. Stir fry chicken until fully cooked, then transfer to a plate. Juices from chicken will remain in the wok. Turn heat up to high and add garlic, peppers, zucchini and onions. Stir fry vegetables, stirring constantly. When vegetables are cooked yet still crunchy, add the rice and mix well. Stir fry the rice, stirring constantly. Add the chicken pieces to the wok and mix. Scoop servings into bowls and top with cheese and salsa while chicken and rice is hot, so the cheese melts.